Ragnar Kjartansson, Nur wer die Sehnsucht kennt (Only He Who Knows Longing), 2015, mixed media, dimensions variable. Ragnar Kjartansson’s mid-career survey is on tour. Following a first showing at the Barbican Art Gallery in London, this US venue adds to the mix Woman in E, 2016, a daily performance originally conceived for a different show at the Museum of Contemporary Art Detroit. The titular woman wears a gold dress and stands on a round gold platform and rotates slowly, repeatedly strumming melancholic chords on an electric guitar. At the opening of the exhibit, the performer looked regal but stiff, constrained by her dress and pedestal that seemed to send up American triumphalism and mourn the continuing American economic crisis clearly articulated in the decay of urban centers such as Detroit and Washington, DC. Kjartansson is a troubadour of doomed idylls. In the exquisite defeatist video God, 2007, for example, he is coiffed and tuxedo-clad, fronting an eleven-piece band. For thirty minutes, on a set a shade darker than Pepto-Bismol, he repeats over and over the warbling refrain “Sorrow conquers happiness.” These kinds of gestures feel teenage-cult-worthy; their wallowing and bloated casualness is their charm. The sculpture Nur wer die Sehnsucht kennt (Only He Who Knows Longing), 2015, is representative of Kjartansson’s approach overall and of the naive watercolor doodles, notes, and paintings-as-performance relics also featured in this survey. 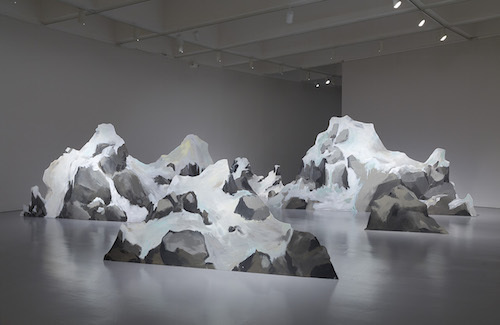 A series of freestanding plywood set pieces, they are blank on one side and painted with snow-covered rock formations on the other side. Meant to be walked around, this scenery evokes an artificial journey or a failed search, incomplete by design because Kjartansson never intends to realize any serious outcomes. Droll and grim, he doesn’t want to.